SC22RL Rear-Load Change Machine by Standard Change-MakersThe premiere SC Series changers are considered the workhorses of the industry – due to their durability, reliability and long life. These changers offer the most secure, best constructed cabinets available, and the System 600 Bill Acceptor offers superior security and programming functions – to help you better manage your self service business. Premier Series machines are easily updated for new currency or software upgrades, and the System 600 Hoppers have proven to be the most reliable coin dispensers in the industry. 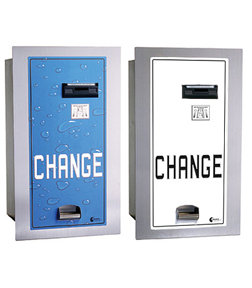 If you are looking for a change machine that will last, the System 600 series is a proven investment! Everything is built with security and durability in mind. The System 600-EF Bill Acceptor can see both the front & trail edge of the bill, and the separating stackers allow you to separate different denominations from each other. It is common to see SC model change machines in high volume businesses working for 10 to 15 years, with many installations in service for more than 20 years. • Shipping Weight: 170 lbs.